Your truck loving child, whether boy or girl, can drive around with the Steer-me Steve Dump Truck by Mega Bloks and pretend he/she is a big rig driver. 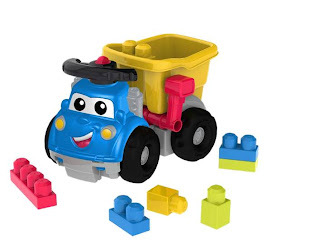 Steer-me Steve is perfectly designed for little hands to grip the steer along wheel as they drive through the house picking up the included blocks in the set as his cargo. Stack the blocks on the truck bed or carry them to a new location for construction – it’s all up to Steve and where your child takes him. Once Steer-me Steve and your child reach their destination, the dump truck bed empties the cargo with a simple lever pull. After Steve is empty, it is time to go find another load! Steer-me Steve's happy, smiling face encourages interaction with your child as they drive around looking for new building adventures! This product retails for $19.99. A random draw will be held on May 14, 2012 by Random.org from all entries received. My son just got his first Mega Blocks bag of blocks and he loves them! This would be fantastic! 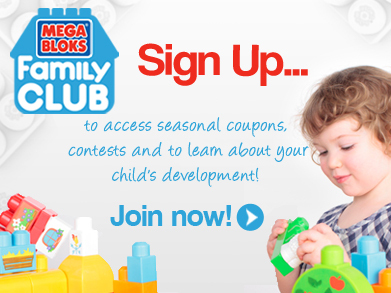 We love Mega Bloks. Steve Dump Truck is cute! My children would enjoy this toy! We have always loved Mega Bloks.